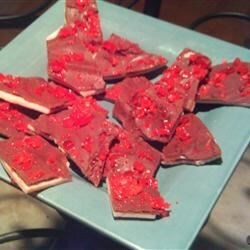 "Similar to the more familiar peppermint bark, this candy is made using crushed cherry-flavored candy canes." Line a 9x13 inch baking pan with aluminum foil. Melt the chocolate chips in a microwave-safe glass or ceramic bowl in 30-second intervals, stirring after each melting, until smooth, 1 to 3 minutes (depending on your microwave). Do not overheat or chocolate will scorch. Using a spatula, quickly spread the melted chocolate evenly in the prepared pan until the bottom of the pan is covered. Sprinkle the crushed candy evenly over the chocolate, and pat lightly with a clean spatula to help the candy settle into the chocolate. Melt the red confectioner's coating, if using, in a microwave-safe glass or ceramic bowl in 30-second intervals, stirring after each melting, until smooth, 1 to 3 minutes (depending on your microwave). Spoon the melted coating into a resealable plastic bag; snip off a very small corner of the bag, and use to drizzle coating over the bark. Place the pan in the refrigerator or freezer until hardened, about 30 minutes. Remove from pan; peel off foil. Break into small pieces to serve. Crushing candy canes is easy when placed in a resealable plastic bag and smashed with a hammer on top of a sturdy wooden or plastic cutting board. The bag will tear a little, but does not interfere with crushing.